A 16-time World Champion he may be, but John Cena sure isn't 'The Man' anymore. SmackDown Live's first show of 2019 came straight out of 2018, as the last of WWE's pre-taped festive shows finally hit the airwaves following the company's December reshuffle. It brought the previous year's high standards with it, too. This wasn't vintage SmackDown, but it was another quality episode from a brand with a higher hit rate than Miguel Cabrera, and a great omen for the year ahead. Though there was no sign of 'The New Daniel Bryan,' much of the programming was built around the search for his next number one contender, highlighted by a blitzkrieg five-way main event between AJ Styles, Rey Mysterio, Randy Orton, Mustafa Ali, and Samoa Joe, who earned his spot by defeating Jeff Hardy earlier in the evening. 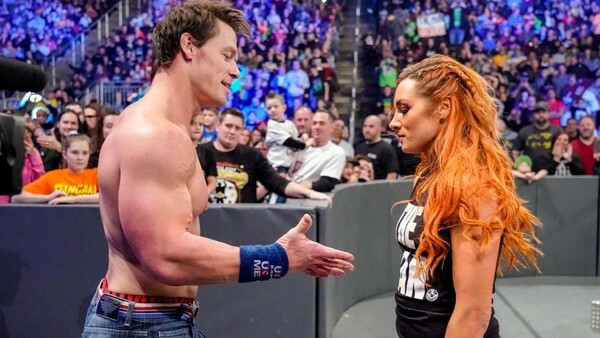 Elsewhere, Styles followed up on last week's assault of Vince McMahon, the returning John Cena went face-to-face with Becky Lynch, and Mandy Rose once again meddled with Naomi's marriage. There was a Rusev Day celebration too, as the new United States Champion basked in his own glory, and Andrade 'Cien' Almas got to wrestle for the second week out of three. Rejoice!